Angry Asian Buddhist: Who are non-ethnic Asian Westerners? A moment later, I realized O’Brien probably had another meaning for the expression: Westerners of non-Asian heritage. 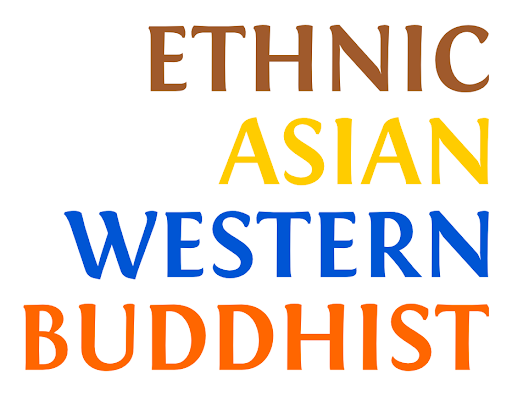 I have given people a lot of flak before about how they use the term “ethnic.” In particular, I would prefer people drop the term “ethnic Buddhist” or “ethnic Buddhism” much in the same way that Americans have stopped using the term “Orientals” to refer to Asians. But O’Brien’s usage is somewhat different. It feels as though O’Brien is acutely aware of the minefield she’s stepping through when she writes about race. She tries to talk about “ethnicity” as a proxy for what is otherwise a conversation about race. The issue is that when you’re talking about “ethnic Asians” versus everyone else, you’re just using our bread-and-butter American racial categories under a different moniker. If you’re going to write about race, then write about it. If you want to talk about the nuanced layers of ethnicity and culture in America, then bring on the nuance. But it doesn’t work when you try to pretend you’re talking about nuance, only to make broad racial statements. There are better ways that ethnic Europeans can write about race and heritage in the Buddhist community. "Non-ethnic Asian westerners"... that's a new one to me. If there was one more hyphen in there: non-ethnic-Asian westerners, that might have made more sense. Still, yeah, why even call it out in the first place? Why not just say Asian-Americans, Immigrant Buddhists, or something? Speaking as an ethnic-white guy-westerner, I find the whole thing exhausting and puzzling.